Buy it Today!! In Stock Now!! Perhaps our most stunning fireplace mantel. This is the Traditional 2 carved from Nero Marquina marble. We offer the Traditional 2 in various stones including white marble and Italian Arabescato. All those are great options and look beautiful. Still no other stone makes as much of a statement as the Black Nero Marquina. That is why we gave it its own name the Los Angeles Black Fireplace. It is also part of our high end Black Label Collection. A finely curated assemblage of mantel surrounds. You can custom order this to your dimensions or purchase it from stock. We do not have many of these left in stock as they sell out quickly. 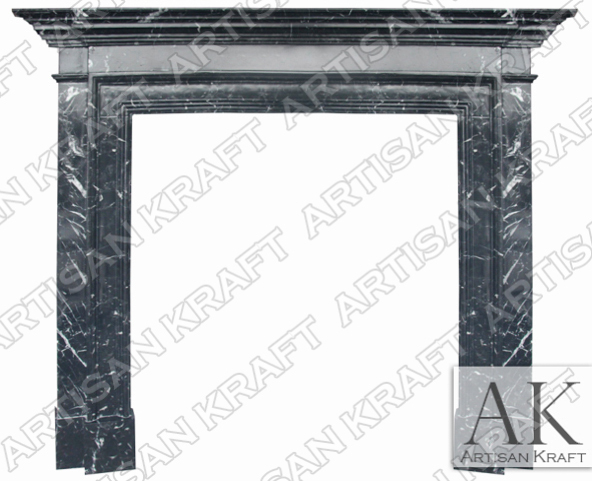 Visit our mantel surround showroom in Chicago or call our offices in Los Angeles California. Pictured in Nero Marquina Black Marble in a polished finish.